Check out my article over at MotoIQ.com. 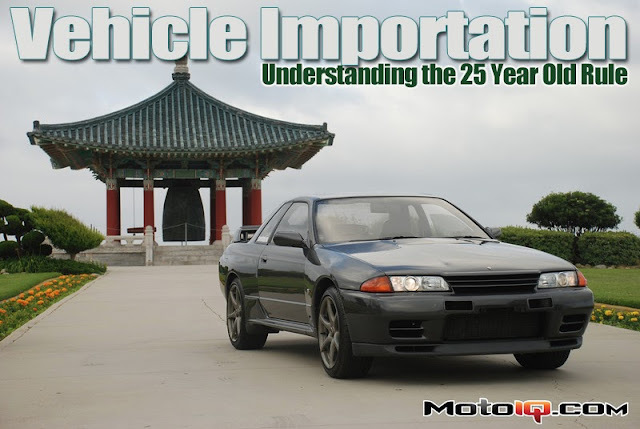 I imported my 1990 NISMO Nissan Skyline GT-R under the Show or Display exemption, however next year, the 1989 R32 Nissan Skyline GT-R turns 25 years old. First off, since it is now 2013 it is legal to import 1988 vehicles that never met US FMVSS (Federal Motor Vehicle Safety Standards) as regulated by the NHTSA, DOT (National Highway Traffic Safety Administration, Department of Transportation). This is because the Code of Federal Regulations Title 49 part 591.5(i), also written 49CFR591.5(i), says you can. Title 49 has to do with transportation while 591 is the section called - IMPORTATION OF VEHICLES AND EQUIPMENT SUBJECT TO FEDERAL SAFETY, BUMPER AND THEFT PREVENTION STANDARDS. The .5 designation is a reference to the subsection that details Declarations Required for Importation and the (i) designation is a reference to a section of that subsection. The legal importation of a vehicle is not up to the guy on a random internet forum, the guy at the DMV or even the police officer on the corner. The Code of Federal Regulations is the definitive word on the rules. The contents of its pages trumps casual opinion. The laws used to only be written in these cool things called books, but now you can look up the parts, numbers, and sections online. If you have access to a hard copy of the CFR like I do, it’s like the worst choose your own adventure book ever. It is a difficult book to read. If you ever pick one up you will probably want to put it right back down. Head over to MotoIQ for the full article. I will be working on some follow up articles on California, and other types of importation later.